New Hampshire Job Training Leads To Careers For High School Graduates — Hitchiner Manufacturing Co., Inc.
Manufacturers across New Hampshire need skilled workers and collaboration between Hitchiner Manufacturing and the Manchester nonprofit MY TURN is providing job training to at-risk youth to fill those jobs. The program, called MY TURN Manufacturing at Hitchiner, helps prepare recent high school graduates who face various life challenges and are unemployed or underemployed by offering training in the skills needed to fill positions. Held at the Hitchiner Milford campus, each class includes ten recent high school graduates who spend half the day in the classroom learning work readiness skills, reading, and math for the workplace, and other tools for career success. The other half of the day is spent at Hitchiner’s manufacturing facility receiving on-the-job training. Because these students often face barriers, such as needing childcare or lack of transportation, the program also looks for ways to help these working students, like help with childcare, transportation, and clothes for work. One of the best features of the program is the small group learning that takes place both on the manufacturing floor and in the classroom. The students are broken into groups of five, with one group doing the classroom learning in the morning and the other with hands-on training. After lunch, the groups switch. In the classroom, students get important instruction not always taught in high schools, like resume and cover letter writing, how to behave at work and financial literacy. The program also brought in local speakers to talk about these issues, such as a speaker from a local bank teaching personal finance and a Hitchiner, mechanical design technology professor, teaching blueprint reading and shop math. Once the four-week course is complete, the students receive a certificate in manufacturing process training. In June 2018, the first class completed the joint training program. All nine were offered entry-level positions with the Milford manufacturer working in the metal cell, metal grinding and the machine shop. Seven in the group accepted positions with Hitchiner, with another planning to return to Hitchiner in the fall. This first class of MY TURN Manufacturing at Hitchiner was a pilot program that MY TURN and Hitchiner hope to develop into an ongoing initiative. Eventually, the organizations hope to have 20 students enrolled in each month-long class, providing five to six classes each year. MY TURN has already had success with a manufacturing program that is coordinated with Nashua Community College. 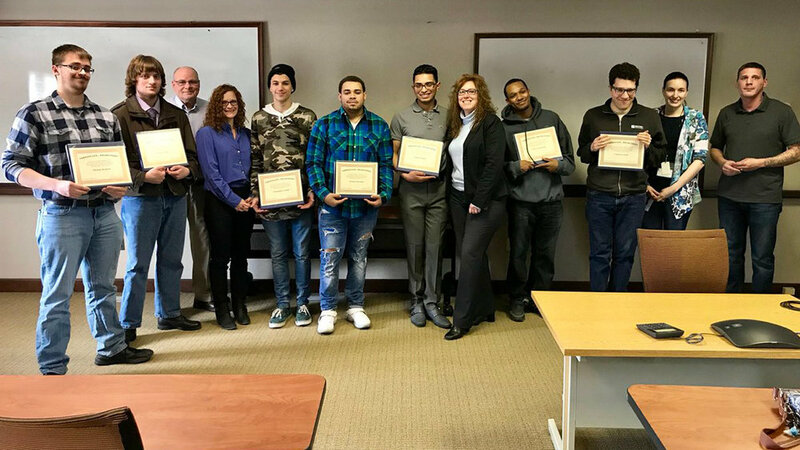 In 2016, 93 percent of students in MY TURN’s Nashua manufacturing program secured a job and 83 percent received a certificate while in the program. Graduates of that program also saw their wages increase by $1,153 per month. MY TURN is an organization based in Manchester and Nashua that works with economically, socially and educationally disadvantaged youth in more impoverished communities in New Hampshire and Massachusetts. The group has been active for more than 30 years and annually works with about 500 students and recent high school graduates through a wide range of programs the group offers, including follow-up services for program graduates. Hitchiner has long been involved in workforce development programs in New Hampshire, including supporting internships and working closely with New Hampshire’s community colleges and universities. Hitchiner has advised and supported engineering and manufacturing programs, as well as developed other training programs for both students and employees of the company. Hitchiner is also a member of the Regional Consortium for Advanced Manufacturing, a collaboration supporting workforce development and training for advanced manufacturing, and hosts students during New Hampshire Manufacturing Week. Hitchiner employees are our most valuable asset, and full-time careers are available now. We are proud of our commitment to education and training by providing tuition assistance to our employees and through initiatives like My Turn. Hitchiner is a leader in workforce development. If you're seeking a career that encourages continuing education and offers advancement, click the button below to view our current job openings.